Click to listen to Candace and Tiffany’s podcast “Alternatives to Western Medicine” on BlogTalkRadio. So many people have turned their healthcare over to western medicine and have little or no knowledge that there are alternative choices that have been around for thousands of years. If you’re dissatisfied with the choices that have been presented to you through western medicine, you might find these other natural healing choices very interesting. This list is not meant to be comprehensive in any way but rather a list of alternative choices that we have tried over the past 30+ years. Herbs have been used for thousands of years and only fell out of popularity with the introduction of pharmaceuticals in the last 50-70 years. Herbs are the basis of Chinese Medicine, Ayurvedic medicine and herbalism today. Herbs are natural, full of vitamins, minerals and phytochemicals needed for good health. Herbs are medicine and very good medicine, very safe medicine without side effects. We became so used to a magic pill that worked fast and you didn’t have to make any life style changes. Modern pharmaceuticals have their origins in herbal medicine and to this day some drugs are still extracted as fractionate/isolate compounds. The pharmaceutical today have many side effects and some aren’t even effective anymore. As we realize this, we have turned back to herbal medicines. They say there is an herb growing somewhere on earth for every disease. Another alternative choice is aromatherapy. Plant extracts have been used for thousands of years for their exquisite aromas and natural healing benefits. By harnessing their therapeutic properties, aromatherapy works to improve our physical, mental and emotional well being. Inhaling the aromas from essential oils can stimulate areas of your limbic system, which is a part of your brain that plays a role in emotions, behaviors, sense of smell and long-term memory. Interestingly, the limbic system is heavily involved in forming memories. This can partly explain why familiar smells can trigger memories or emotions.The limbic system also plays a role in controlling some unconscious physiological functions, such as breathing, heart rate and blood pressure. Some people claim that essential oils can exert a physical effect on your body in this way. I [Tiffany] am a doTerra wellness advocate and I can tell you, essential oils have changed my life and many of my customers. What’s really exciting is that doTERRA announced a new integrative healthcare model which will provide invaluable real-world data and expand the possibilities for scientific research, as well as opportunities to publish and share this information on a larger scale. Through their new clinics, healthcare professionals will be on the front-line of the most cutting edge essential oil research, helping to develop evidence-based clinical and personal usage models. So, have you ever enjoyed the scent of a rose, well...you’ve experienced the aromatic qualities of essential oils. These naturally occurring, volatile aromatic compounds are found in the seeds, bark, stems, roots, flowers, and other parts of plants. They can be both beautifully and powerfully fragrant. Essential oils give plants their distinctive smells and essential oils protect plants and play a role in plant pollination. In addition to their intrinsic benefits to plants and their beautiful fragrance, essential oils have long been used for food preparation, beauty treatment, and health-care practices. But what exactly is a volatile aromatic compound? In short, these compounds are small organic molecules that tend to change quickly from their solid or liquid state to a gas at room temperature. They are called volatile because they change state quickly. When you first open a bottle of essential oil, you instantly notice that the aroma is potent and you can smell it typically even from some distance. The physical and chemical properties of the VAC’s that compose essential oils allow them to quickly move through the air and directly interact with the olfactory sensors in your nose. Such unique properties make essential oils ideal for aromatherapy – using these compounds from plants to help maintain a healthy mind and body – as well as other applications. The type of VAC compounds present in an essential oil determines both the oil’s aroma and the benefits it offers. There is a complete science to how essential oils work with our bodies based on their chemical composition. Over 3,000 varieties of volatile aromatic compounds have been identified to date. The nature of an essential oil varies from plant to plant, within botanical families, and from species to species. The delicate ratio of aromatic constituents found in any given essential oil are what make it unique and give it specific benefits. Esssential oils can be used for a wide range of emotional and physical wellness applications. They can be used as single essential oils or in complex essential oil blends depending on user experience and desired benefit. They can be mixed with carrier oils such as coconut oil to apply to the body and they can be used in a diffuser. Chinese medicine is a complete system of medicine that combines the use of acupuncture, Chinese herbs, acupressure and massage. Health is thought to depend on the balanced flow of energy or qi through the body. Acupuncture is a component of traditional Chinese medicine that originated in China over 5,000 years ago. It is based on the belief that living beings have a vital energy, called “qi” that circulates through 12 invisible energy lines known as meridians on the body. Each meridian is associated with a different organ system. An imbalance in the flow of qi throughout a meridian is how disease begins. Acupuncturists insert needles into specified points along meridian lines to influence and restore balance to the flow of qi. There are over 1,000 acupuncture points on the body. Acupuncture stimulates the release of pain reducing endorphins. Acupuncture influences the release of neurotransmitters, substances that transmit nerve impulses to the brain. Acupuncture influences the autonomic nervous system, acupuncture stimulates circulation. Acupuncture influences the electrical currents of the body. Conditions treated by acupuncture include migraines, tension headache, sinusitis, common cold, addictions, quitting smoking, trigeminal neuralgia, Meniere’s disease, sciatica, arthritis, menstrual cramps, fibromyalgia, low back pain, asthma, weight loss, infertility. Homeopathy is based on the theory that if large doses of a substance cause symptoms of illness in a healthy person, very small doses of the same substance can treat the symptoms by stimulating the body’s self-healing abilities. Homeopathic remedies are typically small vials of tiny white pellets that are usually made from plant, animal or mineral extracts. The original extract is diluted many times using a method called potentization until there are few molecules of the original substance in the remedy. In homeopathy the more a substance has been diluted, the more potent it is thought to be. Homeopathy is considered to be a safe, gentle, and natural system of healing that works with your body to relieve symptoms, restore itself, and improve your overall health. It is considered extremely safe to use, even with very small children and pets, has none of the side effects of many traditional medications, is very affordable, is made from natural substances, and is FDA regulated. It can be used to treat acute illnesses like colds, ear infections, migraines, and sore throats as well as chronic conditions such as asthma, depression, autism and arthritis. Although homeopathic remedies are derived from natural substances, homeopathy should not be confused with herbal medicine, Chinese medicine, or other types of natural medicines. It is its own, unique therapeutic system. So what is homeopathy’s history? The Law of Similars has been documented since at least the time of Hippocrates (ca. 400 B.C. ), but it is Samuel Hahnemann who lived from 1755-1843, who was a German doctor and chemist, who is credited with founding homeopathy. He discovered the truth of the Law of Similars by testing small doses of medicine on himself. By 1900, about twenty percent of doctors in the United States were homeopaths, but due to various political and social changes, homeopathy became relatively unknown in the US until recently. There is wider acceptance of homeopathy in such countries as France, Germany, Mexico, Argentina, India and Great Britain. In fact, the family doctor to England's Queen Elizabeth is a homeopathic physician. In fact, the World Health Organization estimate that it is currently practiced by over 500 million people worldwide. My [Tiffany] first introduction into homeopathy was when I was going to have some minor surgery over 25 years ago and my doctor recommended Arnica. I had never heard of it and it worked beautifully to minimize my bruising. I also used it in conjunction with a recent emergency tooth extraction and I had no pain or bruising. By the way, I also used Frankincense essential oil and the dentist was amazed at how fast I healed. Bach flower Essences were developed by Dr. Edward Bach, a physician who felt that his patients weren’t getting better with conventional medicine and he felt that he should treat the person not the disease. His understanding was that disease resulted from inner disharmony, negative beliefs and feelings that manifested on the physical level. The 38 Bach flower essences create a therapeutic connection between the material and the spiritual domains of life, helping us access the inner guidance needed to navigate through a crisis. Bach flower essences work on emotional issues and are based on the principles of homeopathy. Most people are familiar with Bach Rescue Remedy which is a remedy used if you are experiencing a crisis or having an issue that upsets you, a car accident, illness, you have a bad dream, trouble at work and many more of the small and large crisis’s in life. You can fill out a Bach flower essence questionnaire and have a custom remedy made from the information obtained from the questionnaire. I do Bach Flower custom remedies and consultations at my shop. Tiffany and I have used Bach remedies for many, many years and found them to be so helpful when we have health issues. I always have Rescue Remedy nearby for when I need it. We were raised by a Mother who believed in the power of positive thinking and when we were sick, she always asked us what our bad thought was. So, we learned as children to check in with our emotions to see where our thinking was off and to deal with the emotions in our lives to heal our illness. Ayurvedic medicine or Ayurveda for short is one of the world's oldest holistic “whole-body” healing systems. It was developed more than 3,000 years ago in India. It’s based on the belief that health and wellness depend on a delicate balance between the mind, body, and spirit. Its main goal is to promote good health, not fight disease. But treatments may be geared toward specific health problems. In the United States, it’s considered a form of complementary and alternative medicine. Those who practice Ayurveda believe every person is made of five basic elements found in the universe: space, air, fire, water, and earth. These combine in the human body to form three life forces or energies, called doshas. They control how your body works. The vata dosha is a combination of space and air. It controls movement and is responsible for basic body processes such as breathing, cell division and circulation. Vata body areas are the large intestine, pelvis, bones, skin, ears and thighs. People with vata as their main dosha are believed to be quick thinking, thin and fast and are susceptible to anxiety, dry skin and constipation. The pitta dosha combines fire and water. It is thought to control hormones and the digestive system. Pitta body areas are the small intestines, stomach, sweat glands, skin, blood and eyes. People with pitta as their primary dosha are thought to have a fiery personality, oily skin and are susceptible to heart disease, stomach ulcers, inflammation, heartburn and arthritis. The kapha (“koffa”) dosha represents the elements of water and earth. Kapha is believed to be responsible for strength, immunity and growth. Kapha body areas are the chest, lungs, and spinal fluid. People with kapha as their main dosha are thought to be calm, have a solid body frame and are susceptible to diabetes, obesity, sinus congestion and gallbladder problems. It is believed through Ayurveda that everyone inherits a unique mix of the three doshas. But one is usually stronger than the others. Each one controls a different body function. It’s believed that your chances of getting sick -- and the health issues you develop -- are linked to the balance of your doshas. In Ayurveda, as I’ve explained, doshas account for some of our individual differences. An imbalanced dosha is believed to interrupt the natural flow of prana or vital energy. The disrupted energy flow is then thought to impair digestion and allow the buildup of body waste which further impairs energy and digestion. An Ayurvedic practitioner will create a treatment plan specifically designed for you. They’ll take into account your unique physical and emotional makeup, your primary life force, and the balance between all three of these elements. The goal of treatment is to cleanse your body of undigested food, which can stay in your body and lead to illness. The cleansing process—called “pancha-karma”— is designed to reduce your symptoms and restore harmony and balance. To achieve this, an Ayurvedic practitioner might rely on blood purification, massage, oils, herbs, and enemas or laxatives. When my [Tiffany] body has felt really unbalanced in the past, I have worked with some wonderful ayurveda practitioners to help get me back on track. Naturopathic doctors are commonly referred to as general practitioners of the complementary and alternative health care world. Did you know that a minimum of 7 years post-secondary education is required to become a naturopathic doctor? Most NDs first complete a four year Bachelors degree in the arts or sciences, and then the required four-years at an accredited naturopathic medical college. Students must then pass comprehensive licensing exams in order to be registered to practice.They are trained in herbal medicine, acupuncture, clinical nutrition, dietary supplements, homeopathy, hydrotherapy and physical examination, Lab test or other diagnostic tests. They are also concerned with diet, Lifestyle and environment and mind, body and spirit. 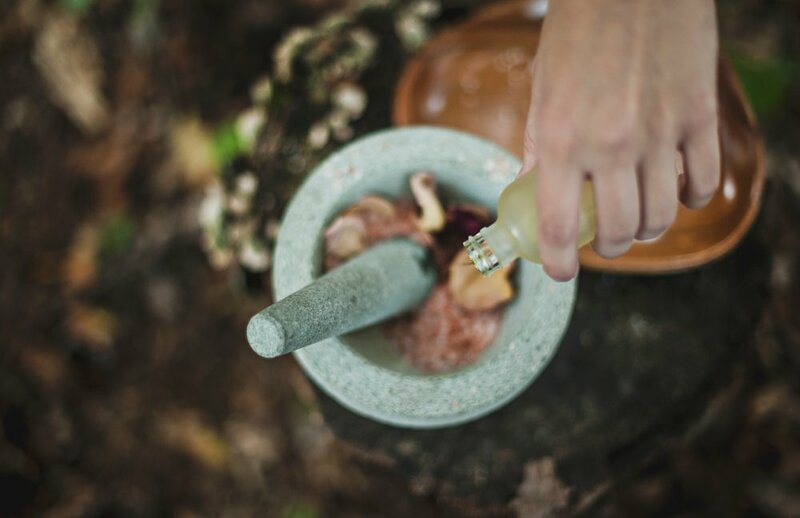 Naturopathic medicine is based on the following principles – the healing power of nature, the belief that the body has the ability to heal itself. They believe in educating their patient. Naturopathic doctors believe in no harm, they treat the causes of disease not the symptoms. Each person’s treatment is individualized in that takes into consideration all the presenting symptoms and causative factors and the belief that prevention is the best medicine for good health. When I first made the switch from western medicine back in 1999, I visited several naturopathic doctors and loved how they take body, mind and spirit into consideration for recommending their treatments. Reiki is a spiritual healing art with its roots in Japanese origin. The word Reiki comes from the Japanese word (Rei) which means “Universal Life” and (Ki) or “chi” which means “Energy”. Reiki is not affiliated with any particular religion or religious practice. It is not massage nor is it based on belief or suggestion. It is a subtle and effective form of energy work using spiritually guided life force energy. Reiki is the life energy that flows through all living things. Reiki Practitioners understand that everyone has the ability to connect with their own healing energy and use it to strengthen energy in themselves and help others. It is believed that a person’s “chi” or energy should be strong and free flowing. When this is true, a person’s body and mind is in a positive state of health. When the energy becomes weak or blocked it could lead to symptoms of physical or emotional imbalance. A Reiki session can help ease tension and stress and can help support the body to facilitate an environment for healing on all levels – physical, mental, and emotional. A session is pleasant and relaxing and is often utilized for one’s personal wellness. Reiki is believed to have been associated with Mikao Usui who is credited with rediscovering the root system now called Reiki. His tradition and methods were passed through several grandmasters of Reiki. Today, Reiki takes many forms, however, The Usui System of Natural Healing is still the form most widely practiced. Practitioners and Master Teachers are trained through an initiation process where Masters pass on their knowledge and expertise to their students. Reiki sessions usually involve the person lying down, and the reiki practitioner places his or her hands on or above various parts of the body. The practitioner channels life force energy to the person to replenish and rebalance areas of the body that are depleted. Reiki is used for a variety of health issues such as chronic pain, stress, recovery from surgery, side effects of chemotherapy or radiation for cancer, improving immunity and a sense of well-being. I personally became really interested in Reiki over 30 years ago when Candace first introduced me and over a course of 3 years, I became attuned to what is called the Master level and I started a Reiki group who volunteered at local clinics. I have to tell you that when I started, Reiki was definitely not as widely accepted as it is today. I was so excited to see when it became more accepted into mainstream alternative healing and many nurses now bring it to their patients. What I love about Reiki is that you can give it to yourself and you can feel the warmth of the healing energy radiating through your hands. Elderberry syrup is very popular recently. Elderberry syrup is used for colds and upper respiratory symptoms by reducing mucous secretions, may fight swelling of respiratory passage, soothes coughs, boosts immunity, for flu symptoms, is a source of Vitamin A and C, bioflavonoids, decrease length and severity of the flu symptoms like fever, chills, sore throat, muscle aches and fatigue. A study shows the patients given elderberry syrup recovered an average of 4 days faster from the flu. Here is a recipe to make your own elderberry syrup or you can buy a bottle of elderberry syrup from your local health food store. This recipe comes the Mountain Rose Herb website. 1 cup vodka or brandy (this is totally optional – it is used to extend shelf life. If you don’t use alcohol it is best to store syrup in refrigerator. Do not add honey to this recipe if it will be given to a child under one year old. Use maple syrup to replace the honey. Combine berries and herbs (not the honey) in cold water in a pan and bring to a boil. Reduce heat and allow herb to simmer 30-40 minutes. Remove from heat and steep one hour. Strain berries and herbs using a funnel under laid with doubled cheese cloth or undyed muslin bag and squeeze out liquid and discard herbs. Once cooled to just above room temp add the honey or maple syrup and stir. Add alcohol if you wish at this point and stir. Bottle in sterilized bottle.